Weave Shed Gallery • 10:00 a.m. – 5:00 p.m. Giving visitors a glimpse into the complex craft that Mary Hambidge loved so well, Christine Jason will be giving weaving demonstrations. 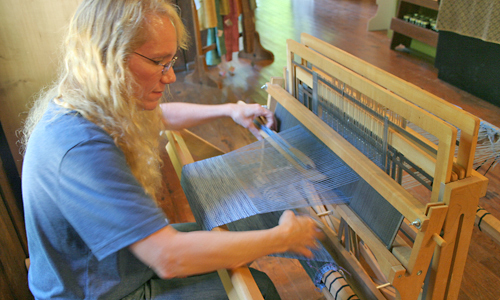 Christine is a self-taught weaver who has been honing her craft for over 10 years. Originally from upstate New York, she has woven museum reproductions for The Adirondack Museum in Blue Mountain Lake, New York. Her current work can be found at Art & Soul in Franklin, North Carolina. We reserve Fourth Saturdays (and sometimes Fifth Saturdays!) for Special Events. These include Gallery openings, workshops, lectures, music and other events yet to be determined.